Lightweight with a clear front, Travel Bags are TSA compliant and stash easily into carry-on bags. Each set is made up of three bags in different sizes, making packing and organizing easy. 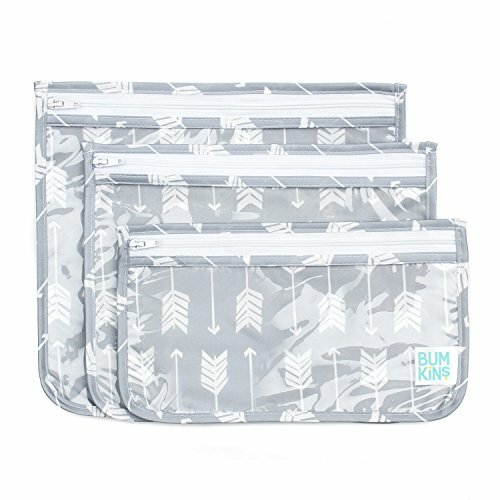 Made from Bumkins' easy wipe, stain and odor resistant, waterproof fabric. Spot clean only. BPA, PVC, Vinyl, Phthalate and Lead free. Designed in Arizona, responsibly made in China. If you have any questions about this product by Bumkins, contact us by completing and submitting the form below. If you are looking for a specif part number, please include it with your message.